Our positions are now filled for the summer 2019 program. We will start accepting applications for the summer 2020 program in fall 2019. This is the home page for the Research Experiences for Undergraduates Program in Mathematics at Oregon State University. OSU has offered a REU Program in Mathematics nearly every summer since 1987! The program is directed by Holly Swisher, and will support 10 undergraduate students for eight weeks during the summers of 2019, 2020, and 2021. Why consider Oregon State University? Three good reasons are the beautiful location, the helpful faculty and the range of projects available. Here are some comments by previous students. Brian Diaz (2016): "I simply cannot think of a better research experience than what OSU provided. This is perhaps the best summer I've had!" 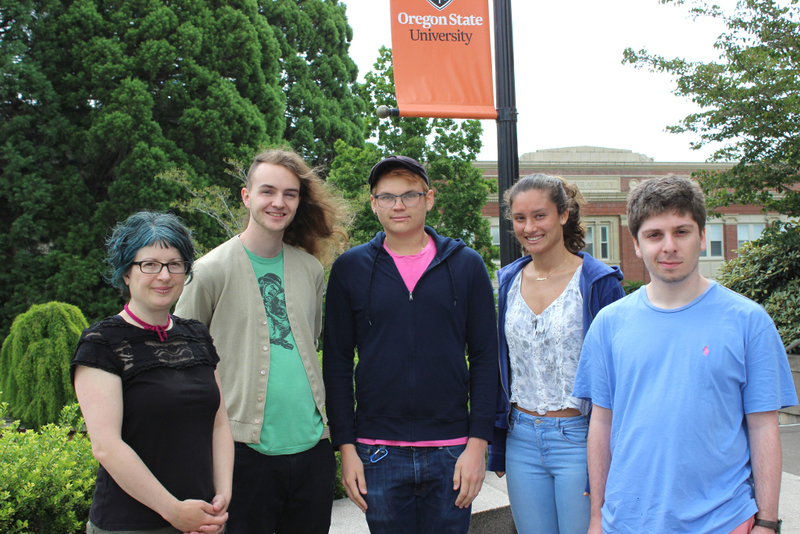 Patrick Dynes (2015): "I appreciated that the OSU REU gave us a genuine research experience. The research projects were fun, but often frustrating, challenges. This allowed us to shape the direction of the projects as we delved deeper into our research. I think this is the most important goal of an REU: to show students what research is actually like, and to encourage those students who decide they might want to pursue mathematics after the program is complete." Alexa Rust (2013): "I cannot think of a better way to have spent my summer. I made great friends and had a fantastic time doing mathematical research." Joey Dickens (2013): "A great place to do math for the summer. The advisors help their students just enough to allow them to do their own original thinking. A great experience!" Matt Mizuhara (2010): "The Oregon State University REU in mathematics provided me an incredible and enlightening exposure to extensive research. The tools gained will last a lifetime, and the experiences had will always be some of my most memorable. It was a truly unique and broadening experience." Emily Putnam (2001): "The REU at OSU is a wonderful, intellectually stimulating program, providing great exposure to higher math. Come and have fun for your summer working in areas you won't see in your regular program." Jennifer Kimble (2001): "The REU at Oregon State is definitely worth your time. The atmosphere is relaxed, so all you have to worry about is your project. The state of Oregon is absolutely beautiful and is a 'must see' for everyone." Braden Soper (2001): "The Oregon State University REU was a great experience that made for a wonderful summer. It provided an intellectually and socially stimulating environment placed in one of the most beautiful states in the country. I highly recommend it. GO BEAVERS!"